Hemorrhoids can be uncomfortable, itchy and can take weeks to heal. You can relieve the discomfort and itch of swollen hemorrhoids while encouraging healthier tissue to grow. These pads are MORE than just Witch Hazel and alcohol. The many herbs selected for Hemorrhoid Relief are time-tested. 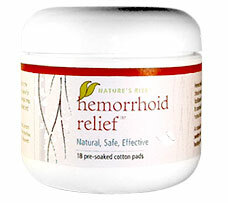 People have been suffering from Hemorrhoid issues for ages. Believe me, this is one tested solution. Additionally, Hemorrhoid Relief™ contains herbs to promote the body to soothe and restore healthy tissue in the region for faster healing. Ingredients: Witch Hazel, Aloe Vera, Mullein Leaf, White Willow, Feverfew, Calendula, Licorice Root, Comfrey, Chickweed and Oak Bark. I’m Steve Frank, the Herbalist for Nature’s Rite. I developed these pads for when I had a hemorrhoid issues. I didn’t want just to shrink them; I wanted them to stop itching, hurting and swelling. These pads are what you want. I know that because they are what I wanted. Don’t settle for some super-market special. These pads are worth every penny. I personally guarantee it. Try them now. You won’t be disappointed.